Our first conversations with Northeast Presbyterian took place in early 2015. At the time, they had two fading projectors hitting 4x3 screens on either side of the stage, which clearly were added to the beautiful space after the fact. After exploring a replacement of these screens, the church decided not to do anything at the time. However, the seeds were planted and in January of 2016 their team reached out to renovate their existing space in less than nine months. The primary goal of the project was to update the feel and function of the sanctuary into a versatile space, where their traditional orchestra and choir driven service would feel just as comfortable as their contemporary band-driven environments. Additionally, it was important to honor the tradition and reverence of the room, which has been their primary meeting place for nearly 30 years. Collectively, we had three and a half months for the entire renovation to be designed architecturally and technologically. This necessitated working closely with the architect from day one, helping to develop the look and feel of the room in an extremely fast-tracked process. From audio systems and LED walls, to beam placement and ceiling height, we were invested in every detail of the environment. Due to the advanced timeline, we worked incredibly close with the architect throughout the entire project - swapping 3D models back and forth regularly from high level concepts to schematic designs. Active collaboration amongst all parties was paramount to the overall success of the project, which had an extremely aggressive construction schedule, and an opening date that was set in stone. The technology systems were intentionally specified to maximize longevity of the investment and ensure a powerful yet "volunteer friendly" ecosystem. 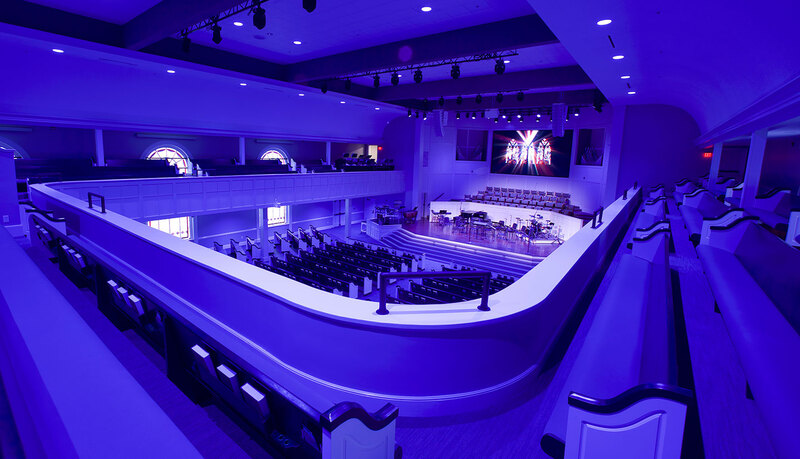 Guardian by Mankin allows for remote support during services and events, serving as an effective safety net for the church's staff and volunteer teams. It was determined early on that a large “digital canvas” LED wall would be centered behind the choir loft as an anchor to the overall environment. It was built using 84 of CreateLED’s 3.9mm panels, and the display is fed by a Ross Carbonite switcher with Renewed Vision graphics, Panasonic PTZ cameras, AJA routing, and terminal/engineering equipment from: Ross, Decimator, AVP, Ikegami, and Novastar. Stage and house lighting would be key to enhancing, and fine-tuning, the look and feel of the space, so the entire system – including house lights – is 100% LED. All stage fixtures are from the Chauvet Rogue line, and pan/tilt/zoomable with full RGBW color mixing from the GrandMA lighting console. This allowed us to maximize flexibility of the system, while minimizing the number of fixtures and associated power draw required. Additionally, all light fixtures are on truss with motors that allow lowering of fixtures to the floor for maintenance. Concise audio was crucial to the success of the project, as it needed to be equally distributed, but not over-treated, to serve both musical styles. This led us to partnering with an acoustician who did strategic listening sessions in the existing space, as well as exhaustive measurements of the space to really fine tune the design. We landed on an L’Acoustics Kiva line array system. SB15 single 15″ subwoofers were flown behind the main PA that acted as an extension to the system, and SB18i single 18″ subwoofers were built in to the stage to supplement additional low frequency content for the room. While the church was excited to update the feel and function of their current space, there was also a sense of hesitancy, as it was very clear they did not want to compromise their more traditional services. Additionally, there was apprehension that so much new technology would create challenges for their volunteers. Ultimately, these areas became points of pride in the project. We not only heard their concerns, but also actively sought to address them through innovation and education. Projects of this magnitude, paired with accelerated timelines, can often be tricky. However, there was a sense of unity and common vision from day one that seemed to propel this entire project to go remarkably smooth. The dedication of Northeast Presbyterian to not just preserve, but also amplify, the existing beauty in their space was invigorating, and we’re so grateful they invited us to be part of the solution.